There's something that Mega Man Volnutt and I share. We've both been gone for awhile. I've been away for over two weeks and Mega has been out for over a decade. 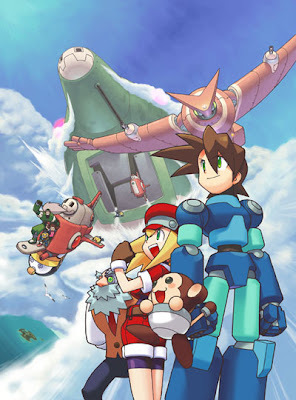 I can't even imagine what Keiji Inafune had to do to make sure this game got the green light. I imagine it involved lots of blood and sacrifices. I'm talking about goats. So here's what's up: It's official. The trilogy can finally come to a close and I can give Inafune copious amounts of bear hugs if I get his permission. The reason it's called a "Project" is that Inafune is doing something very interesting this time around: letting the fans submit ideas and vote on several aspects of the game. This is probably the largest involvement of a fan community in any single production of a video game to this day. The game itself will eventually come out for the 3DS but the project is starting with baby steps for now. Inafune knows that the last game wasn't exactly a financial success. He's hoping that as a community, we can pitch in and make the greatest game possible and change the outcome this time. Let's prove Inafune right, save Christmas, and prevent World War 3 all in one go! This is Kylak signing out and peer pressuring you to go vote.